Since 1958, Conestoga Tile has been supplying floor covering dealers, contractors and re-modelers with some of the most beautiful ceramic, porcelain, natural stone, glass and metal tile products available from the United States, Italy and other points around the world. 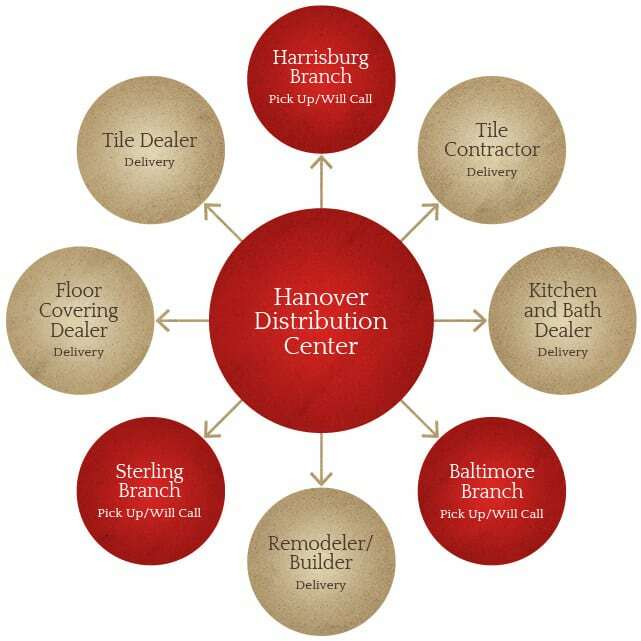 We are a full service tile distributor servicing PA, MD, DE, WV, VA and DC. We are known for great quality products, superior product support, customer service, competitive pricing, on time delivery and educational events and seminars. What sets Conestoga Tile apart from many other ceramic tile suppliers is that we are a wholesale ceramic tile distributor with professionally staffed showrooms. We encourage all of our trade customers to view our showroom as an extension of their own business as we are their sales staff when their customers visit one of our showrooms. At our showrooms, we take the time to educate all homeowners and other consumers about our tile, present them with products that are appropriate for their particular project, give them professional design advice and provide them with suggested retail pricing. We communicate the product selections and design to the contractor or dealer to prepare a quote for final installed pricing. In addition to the use of our showroom, we partner with dealers by providing professional, easy to use marketing displays for showrooms. All of our displays are supported by a dedicated Conestoga Tile sales representative who ensures the display is kept up to date and that the dealer’s sales people are properly trained. We use a “Hub and Spoke” distribution model. Our central distribution center is in Hanover, PA. Here is where the complete inventory of products resides. All orders for products that are in the Hanover inventory placed by 4:00 pm (Mon. thru Fri.) can either be available for pick up by 7:00 am the following business day at a branch location or on your regularly scheduled delivery truck. Special order products are distributed as soon as they are available. Our showroom branches are well stocked with allied products (grout, mortars, tools, cleaners and etc.) that an installer would need on a day to day basis.